They checked blood pressures. They talked nutrition and shared recipes. They even played Wii bowling. No, these Augsburg physician assistant students were not messing around with the equipment or just taking a break from studying in the halls of Anderson. 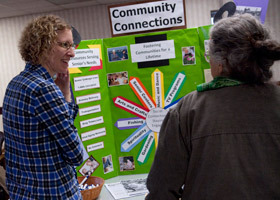 They were completing a unit on working with older adults by hosting a community health fair for residents of Augustana Apartments in downtown Minneapolis. On this afternoon, second-year students in the last semester of the academic phase of their program worked in groups sharing information with residents about wellness, specific health problems of older adults, exercise, nutrition, socialization, and community resources. Ashley Millette and Nick Meath were two students who helped residents learn about assessing their risk for a stroke. They offered a light-hearted video clip to give information about this serious topic. "We think it's important for older adults to recognize the signs of stroke," Millette says. She added that stroke is the third leading cause of death among older Americans and 80 percent of strokes are preventable." "It's a great experience, especially for students who haven't been able to grow up knowing their grandparents," says Andrea Wold, one of the students. Her group gave samples of a low-calorie fruit dip and shared recipes for soups, salads, and desserts that were especially selected for the residents. "The intent is to help students get a better understanding of the challenges and issues faced by the older adult community," says Beth Alexander, an associate professor in the PA program. "A lot of these students don't spend much time with older adults, and we feel it's important to train them to care for patients of all ages." The Augsburg PA program is unique in that it dedicates an interdisciplinary unit to study healthcare issues of the aging population. In addition to learning about the needs of older adults, students are paired with a senior mentor for 10 months. Students will spend time with the mentor learning about their lives, sometimes taking them to doctor appointments or engaging in recreational activities. "Many students become friends of their mentors and continue to see them after the semester ends," Alexander adds. After completing the academic phase of their program, students will move into clinical rotations. To learn more about the Augsburg Physician Assistant program, go to the admissions website.